Two years ago several members of the Open Geospatial Consortium (OGC) including MapInfo, Autodesk, Intergraph, and Laser-scan began an interoperability initiative that was designed to make it possible for a standards-compliant application to display a map from any standards-compliant datastore. The initial objectives were standards for oriented points and cartographic text. Cartographic text turned out to be a bit contentious because it conflicted with a traditional perspective that stylization information did not belong in the database with geospatial data. I am happy to report that the Open Geospatial Consortium OGC membership is revising the simple features (SF) specification and a key discussion item is how to best handle cartographic text. This will have important implications for RDBMS vendors like Oracle that support spatial data as well as for geospatial vendors that consume spatial data. I am optimistic that we will see the OGC discussion result in a modified SF that will include cartographic text and that we will see support for the revised SF specification in future product releases from Oracle, MapInfo, Autodesk, Intergraph, Laser-scan, Bentley, and others. One of the areas that people are uncertain about when they consider open source software is support. When you buy (or these days subscribe) to a closed source software product there is invariably some type support available, for example, an email address or a telephone number, terms and conditions, and an explicit charge. In contrast in the case of open source people are often uncertain about how to get support. Red Hat is an example of a company that early on realized that companies who were relying on Linux for critical business processes required support. Red Hat's versions of Linux are open source and can be downloaded and used without a commercial arrangement with Red Hat. However, Red Hat has created a viable business (Red Hat's market cap was $4.3B the last time I looked) by realizing that people using Linux are willing to pay for commercial support and services. In the open source geospatial community there are similar types of arrangements though they are not well known. Recently DMSolutions Group, which is a member of the Open Source Geospatial Foundation (OSGEO) has announced that in July they will be providing commercial support for open source web mapping technology (Premiere Services ). Initially they will be providing this service for MapServer, but they intend to extend this support in the near future to MapGuide, which is the OSGEO's next generation web mapping application. To me this represents the next step in the maturing of the open source geospatial sector. This means that anyone who wants to use open source web mapping now has an easy way to find support for their solution. From time to time I plan to invite people who have an interesting perspective (based on real world experience) that reinforces some of the themes that I have been focusing on to contribute to this blog. Sharing spatial data especially between CAD and GIS has been a theme of several of my blogs, and I invited Charlie Crocker who has worked in the geospatial arena for over 15 years in the western US, to give his perspective. 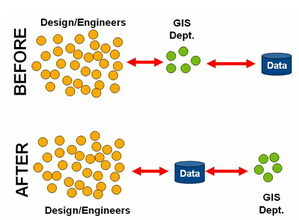 To manage and maintain a current and accurate record of infrastructure, a GIS specialist in a city’s public works department is commonly required to work through an extensive backlog of field updates and as-built information about the precise locations and details of city buildings, roads, bridges, sewer systems and other infrastructure. This data is seldom readily accessible from the CAD system in the Engineering department and requires time consuming processes to translate and transform into GIS data. GIS professionals know how hard this task really is in most cities. You need to request the information from someone in another department and then convert the data from one format to another format. It is a process that can take days—or even weeks. It likely requires some custom programming. What’s more, it often leaves the resulting information full of holes. Have you ever exported a true arc from CAD to a Shapefile or tried to maintain attributes transferring data from GIS to CAD? There’s not just a physical wall between GIS and Engineering departments. There’s a “wall of mystery” that has separated the CAD and GIS worlds for years, a cultural divide leaving practitioners on both sides wanting more and often feeling alienated by the other. From a technology standpoint, CAD engineers have been blessed with intelligent, powerful graphical tools that allow them to produce highly detailed design specifications of buildings, bridges, machinery, utility assets, and even spacecraft. Whereas, GIS specialists take advantage of incredibly robust spatial databases, perform sophisticated spatial analysis, and generate compelling “beautiful maps”. By working together CAD and GIS teams have a lot to gain. GIS teams can leverage the abundance of CAD-trained domain experts to help maintain data and provide a detailed understanding of specific workflows, and data relationships. 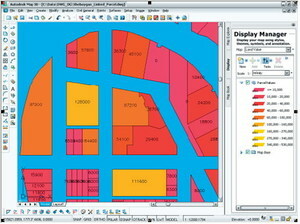 CAD teams can leverage centralized GIS databases to efficiently store and share valuable infrastructure information. There is no need for either the GIS or CAD teams to prescribe the tools that the other should use. The technology is available to allow each team to utilize the toolsets and environment they are familiar with. There is great value in providing CAD engineers robust, native access to spatial datastores like Oracle Spatial, My SQL, and ArcSDE and giving GIS professionals direct access to object-based design data stored in CAD files. Native data access means no conversion, no data loss, no data copies, and best of all no stale data. This can mean not more hunting around for the most current version of the data or making decisions based on information that might be out of date. By leveraging the power of both CAD and GIS, asset management, utility companies, engineering consulting firms, public works departments, and more are able to build more efficient workflows. For example, a project moves more quickly when an engineer can easily pre-populate a new design with current base map data from a central GIS—such as property lines, curb information, and other associated data. And by using simple theme mapping and legend based map controls, a CAD designer has much more flexibility stylizing objects and ordering layers in a CAD drawing. GIS specialists can leverage powerful precision editing tools in a CAD system to more easily edit and maintain GIS data. Infrastructure development and management companies are beginning to understand the need to use both engineering-design tools and mapping technology together and to seamlessly work with CAD and GIS data together in a single. Integrated CAD/GIS tools lets you directly access spatial databases, like Oracle Spatial and ArcSDE, and GIS data and work with them in a hybrid CAD and GIS environment. With a combination of smart, spatial databases and intelligent CAD-based graphical editing tools, organizations can recoup lost productivity, improve data accuracy, and streamline workflows. And best of all, by blending the two technologies you gain the benefits of working with high precision data in a seamless map-based environment. Imagine being able to seamlessly search for a parcel and also being able to precisely locate the utility connections and detailed design information related to structures on the property. Or, why settle for a single polygon representing an entire airport when detailed design drawings are available? 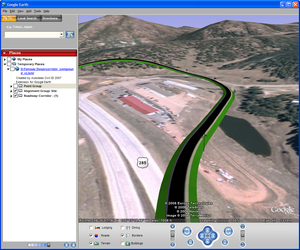 Typically, organizations have invested in both CAD and GIS. They bought powerful, industry standard CAD tools for engineers and drafters to precisely design roads, buildings, and other assets and deliver detailed specification, as well as traditional GIS application suites to conduct spatial analysis and generate maps of more generalized information. Each group developed its own separate workflows, standards, and data – despite the fact they often managed similar data and both had a skilled workforce of spatial data practitioners. Let’s consider a civil engineer who needs spatial information for context and a starting point for the location and engineering design of a new bridge. How does he work with his GIS counterpart? They improvise. The engineer makes a request to the GIS department; data is compiled, converted and maybe even digitized. Through a lengthy and convoluted workflow, chances are good they’ve also introduced errors, stroked arcs, missed attributes, and lost valuable precision. CAD and GIS professionals alike are beginning to see the advantages of each others technology and of working together share data, processes, and personnel. Engineering departments have teams of data management professionals (called engineers, designers, or CAD drafters) who manage large quantities of spatial asset information using CAD-based tools. It is not uncommon to find an engineering department with 50-100 CAD trained professionals in an organization with 1-3 GIS professionals. Providing CAD engineers with mapping functionality and native access to spatial databases opens the door to a much larger spatial data workforce that can be leveraged to support the expanding role of spatial information. In today’s competitive environment and shrinking budgets both public and private organizations are finding it costly to maintain separate CAD and GIS functions. It is expensive to manage multiple types of software, convert data, synchronize systems, and keep design and operations disconnected. And it is also difficult and expensive to purchase new software and retrain CAD or GIS professionals to use the others technology. I have worked with several public works departments and both public and private utilities that have small GIS departments scrambling to keep up with work orders, and the constant stream of as-built drawings and changes from the field. In many cases these same well-trained and experienced GIS specialists and managers are not domain experts when it comes to the infrastructure they are asked to manage. These same organizations have a well-trained CAD workforce that are domain experts, understand the utility network, how it is built, what issues need to be addressed and what needs to be tracked. What is even more compelling is that the GIS managers are finding it difficult to hire and retain well-trained GIS professional, especially any with specific domain expertise. These GIS managers are beginning to look inside their own organizations to find domain experts with an understanding of spatial data and finding a large pool of potential in their organizations engineers, designers, and CAD drafters. By bringing these two worlds together, CAD and GIS professionals can work together to share information—geospatial and design data—transparently among project team members. If needed, the data can travel to downstream users, such as operations managers, facility managers, and field technicians - even to the general public via web sites. With CAD/GIS integration, organizations can use existing resources, reduce data redundancy and errors, and streamline workflows. As a result, they complete projects faster—and at lower cost. Engineering and GIS professionals need tools that bridge the divide between CAD and GIS without necessarily asking either the CAD or GIS professional to give up the tools they have been using for years. In other words, it means bringing GIS and mapping functionality into the precision data capture, creation, and maintenance tools in a CAD environment, including native access to spatial databases. And, in addition, it means providing the GIS environment with the ability to access and work with object-based design information stored in CAD drawing without losing precision through data conversion. Essentially, the technology supports a streamlined workflow. 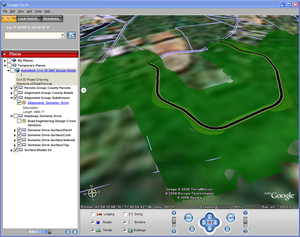 People can create and edit with CAD tools, and store the data in a central place for other people and applications, including GIS applications, to access. This type of data organization and workflow leverage the best technologies without losing valuable information by translating data from one format to another. 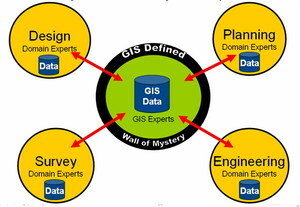 There has been a cultural divide between CAD and GIS propagated by the “wall of mystery” surrounding GIS. CAD/GIS integration provides the ability to seamlessly work with both CAD and GIS data within a single environment and the power to blend powerful CAD design tools with robust, well-managed geospatial database is no longer a mystery. It is easier than ever for engineers and GIS professionals to work together, leverage each other’s domain expertise, and share information. We all work in hybrid IT environments with many different applications and databases. Our success is predicated on our ability to work together to blend our technologies, experience, and understanding. We will not be successful if we build walls and eschew technological diversity. The longer the “wall of mystery” remains, the deeper the divide with grow. Now that the technology is out there, it is demolition time.